Take your digital music collection to another level with High-Resolution Audio. By capturing music at a higher rate than CD, increasing both audio samples per second and the bitrate accuracy of each sample, High-Resolution Audio offers a near-perfect capture of an artist’s music. Savor every breath and subtle movement for a truly emotional experience. Hear natural depth and total clarity in all your audio. 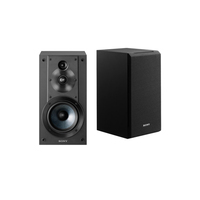 The 3-driver bookshelf speakers include a rigid 5.12 in MRC woofer for dynamic bass, along with a 0.98 in tweeter and 0.75 in super-tweeter designed to reproduce High-Resolution Audio tracks. 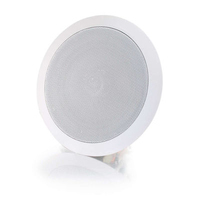 Supported by a compact footprint and up to 100 W input power handling, these speakers truly are the perfect match for any room. Feel your favorite music unfold throughout the room with precision and balance. 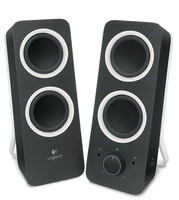 These speakers include new super tweeters with wide directionality. High-frequency notes are reproduced precisely across an expansive soundstage—you can even sense the positioning of instruments—for an experience that’s close to being there. 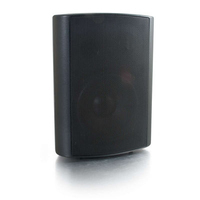 This speaker system incorporates a newly developed 5.12 in woofer for deep, stable bass. Utilizing a foamed mica-cellular diaphragm, it produces both powerful bass and the finer detail required for clear vocals and dialog in the mid-range. The ported, all-wood enclosures are built for resonant acoustics. Unwanted vibrations are dampened and absorbed, thanks to a rigid construction which includes interior joints strengthened with a solid wooden structure. Our designers also optimized the type and layout of interior sound absorbing material to control, and precisely tune, cabinet resonant vibration. These small, bookshelf speakers are very compact and space-efficient for easy installation in tight spots. Despite their compact size, they offer a wide frequency response, right down to 53 Hz, making them an ideal choice when you don’t want to sacrifice sound quality for space.